In 1985, the Happy Mondays fused a sound that owed as much to northern soul and funk as it did rock and psychedelia. influenced by the house music beaming in direct from Chicago, they enjoyed a huge run of success, and excess. The 1990 album ‘Pills ‘n’ Thrills and Bellyaches’ collided perfectly with the acid house and rave movement, firmly planting Happy Mondays on the map as one of the most brilliant bands, at the time, to come out of England. The band achieved cult following, inspiring a nations of bored youth with a publicly, and ridiculously debauched lifestyle…with the addition of some seriously fantastic records. 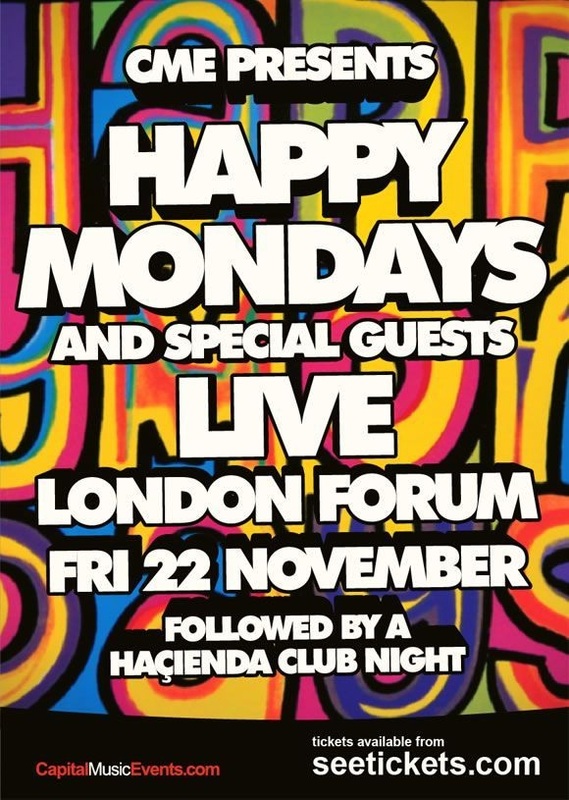 This November legendary ‘Madchester’ band Happy Mondays return to London for an epic performance at The Forum. Celebrating the fact they’re still alive – considering their lifetime dedication to narcotics – OH, and the 25th Anniversary of their first LP – expect heavy festivities, wild jubilation and some very special guests. May’s show – the first in 19 years – caused a media frenzy, and sold out completely. Smashing two nights at the Brixton Academy, with a two-night residency at Camden’s heritage Roundhouse (courtesy of CME) they also brought along acid house pioneers – 808 State – just for fun.